Heima (Director: Dean De Blois, 2007): Ever since Bob blogged about the trailer way back in August, I’ve been desperate to see this film. Screenings have been carefully controlled, and I was fortunate to attend the first Canadian screening last night. Although the film was released on DVD a few days ago, there is really no comparison to seeing a film like this on a big screen with a decent sound system, among a group of like-minded music fans. Sigur Rós is a band from Iceland whose music is nearly indescribable. It’s orchestral and epic and spiritual and beautiful and moving. I’d seen the band perform at Massey Hall a few years ago, and I’d compared the experience to “seeing God.” The film does not disappoint. First of all, despite the filmmakers’ stated desire to avoid the “touristy” shots of Iceland, it’s impossible to make the country look anything but breathtaking. My wife and I plan to visit in 2008, and this just got me even more excited. I liked the way the film travels with the band to different places in the country to perform free concerts for the population. And I loved that everyone came, from babies to grandparents. It reminded me of my travels in Newfoundland, where evenings at the pub were attended by almost everyone. 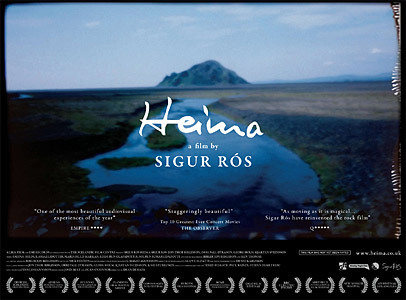 The music was superb, and by the time I finished watching the film, it was quite possible to believe that Sigur Rós is the only band that matters. The interviews with the band members didn’t add a lot in terms of insight into the music itself, but it was nice to see them in relaxed settings speaking their quirkily-accented English. I will say without shame that I dozed a little at certain points. That’s not an insult to the music or the imagery. It just felt like the line between waking and dreaming was so thin that was easier to cross over. It didn’t hurt/help that the screening began at 11:15pm and that I’d spent the early part of the evening drinking beer. I’ll look forward to seeing this again and again when my DVD arrives, but I’d recommend trying to see this in a cinema if you can. This entry was posted in Documentaries, DVD, Theatrical Release and tagged Documentaries, DVD, iceland, music, Theatrical Release. Bookmark the permalink. If you hear of another screening in town, let me know.